Mahi-mahi, dolphinfish, or dorado (Coryphaena hippurus) is a pelagic or open ocean fish found at the surface in temperate, tropical and subtropical waters around the world. RECOVER experimental trials will utilize mahi raised at the University of Miami Rosenstiel School of Marine and Atmospheric Science. Why are Mahi-Mahi so important? In the Gulf of Mexico and other areas where mahi are common, they are highly coveted as a sport and food fish. Saltwater recreational fishing alone brings in over $10 billion to the Gulf states. It is therefore crucial to understand the full impact that oil exposure has had on this species. 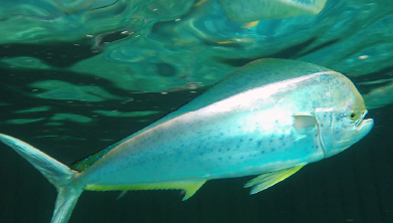 Why did RECOVER choose to study the Mahi-Mahi? Mahi were selected for RECOVER to expand upon existing research done with them in oil toxicology as well as to provide a contrast to the coastal red drum. Oil concentrations varied between the two ecosystems and it is not fully understood how each species responded. Mahi are found far offshore, closer to the Deepwater Horizon site whereas red drum are found in nearshore habitats, some of which received stranded and more weathered oil.